TCP/IP, VoIP, POTS, FAX, scanner, printing, videoconference, radio/phone interoperability and other services are available with this system. The training consisted of two days of hands-on classroom and lab work. 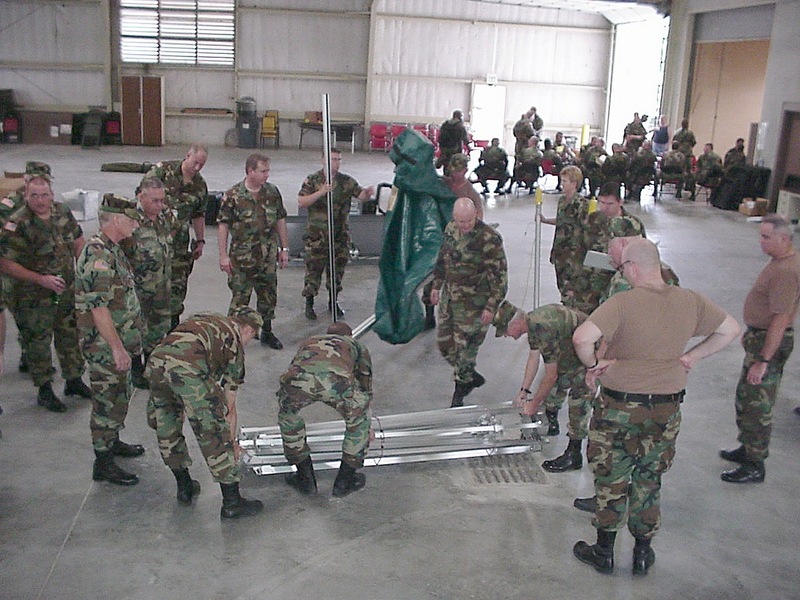 The test was to unload the gear in a deployment area, set it up and get all aspectes of it it operational under pressure of time, adverse conditions, and simulated user demands. (by user demand, of course, I mean everyone from state and local officials, and military men from Captains to Generals asking why their phone call, radio, fax, or video conference is not ready and when it will be ready, several phone calls coming in and needing to be patched, before the system is up fully, etc. 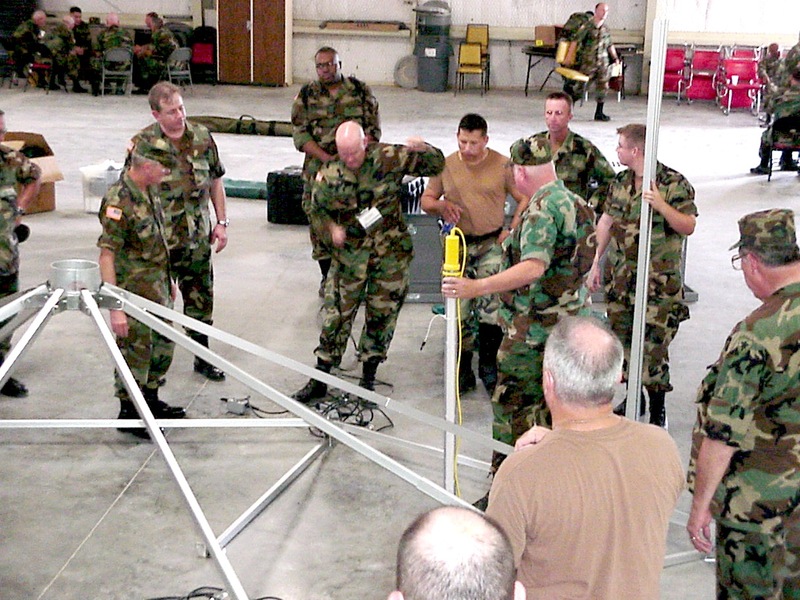 ;-) Communications personnel from each brigade of the State Guard were tasked to receive this training. A great time was had by all, and the teamwork was great. HOOAH! 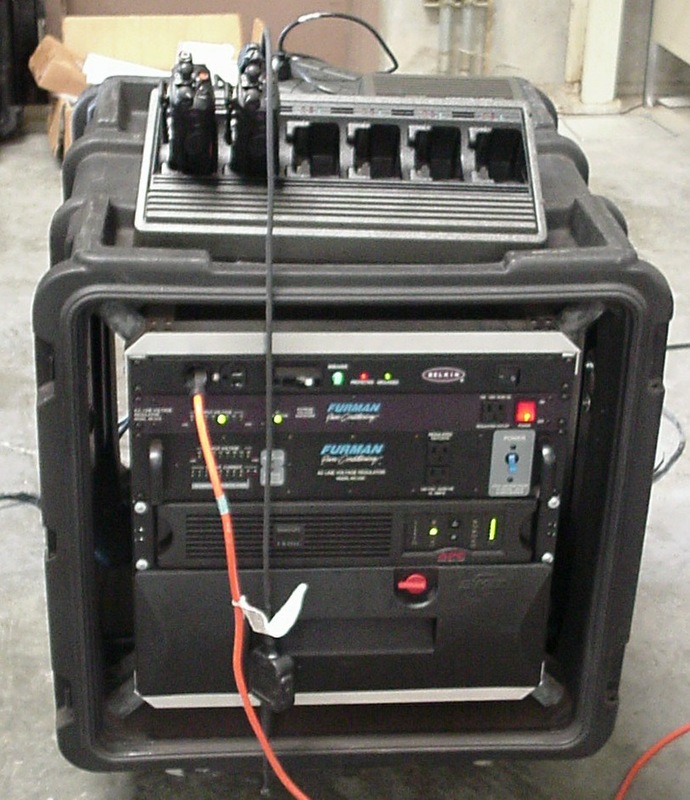 The system can use commercially available 120VAC power and requires two 20 amp connections. A 15KW generator is supplied with the system in case commercial power is not available. 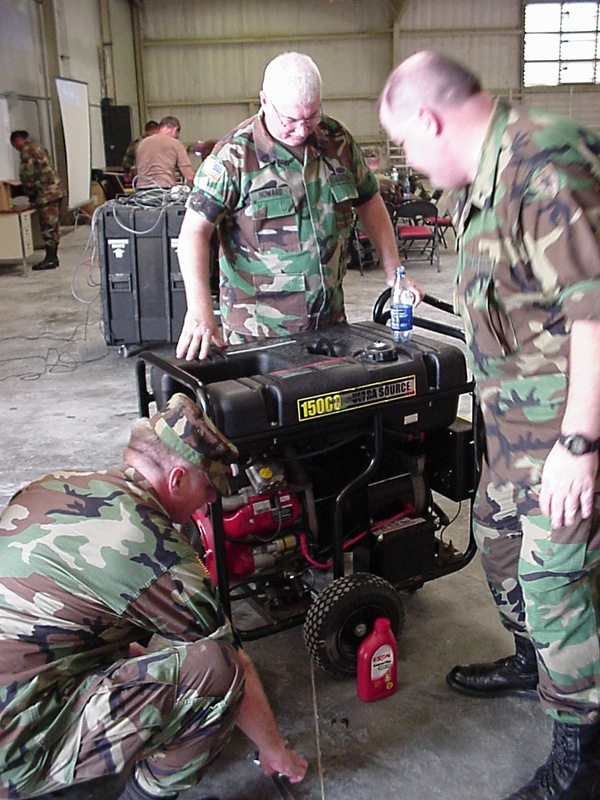 Before use, the generator is checked to make sure it is good to go. We found that the oil level was substantially above the full mark, so we drained enough out to correct the level. 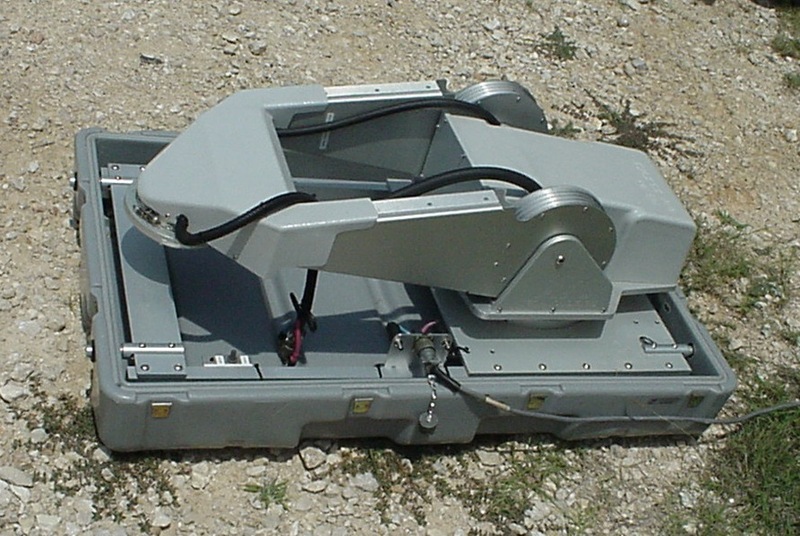 The base and aiming servo system of the sattelite link is shown in the shipping position. 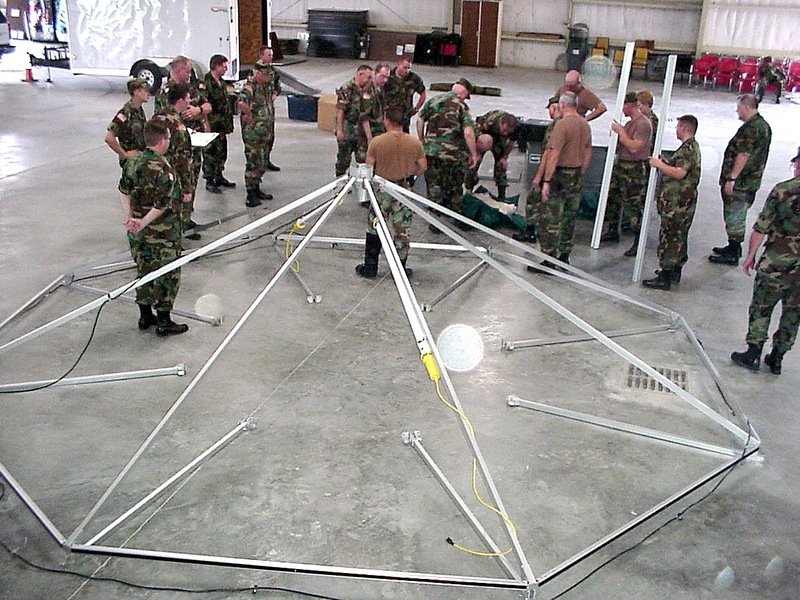 The mount is facing downward, as is the attachment point of the dish assembly. Radio rack. The top two sections contain the radio control heads. 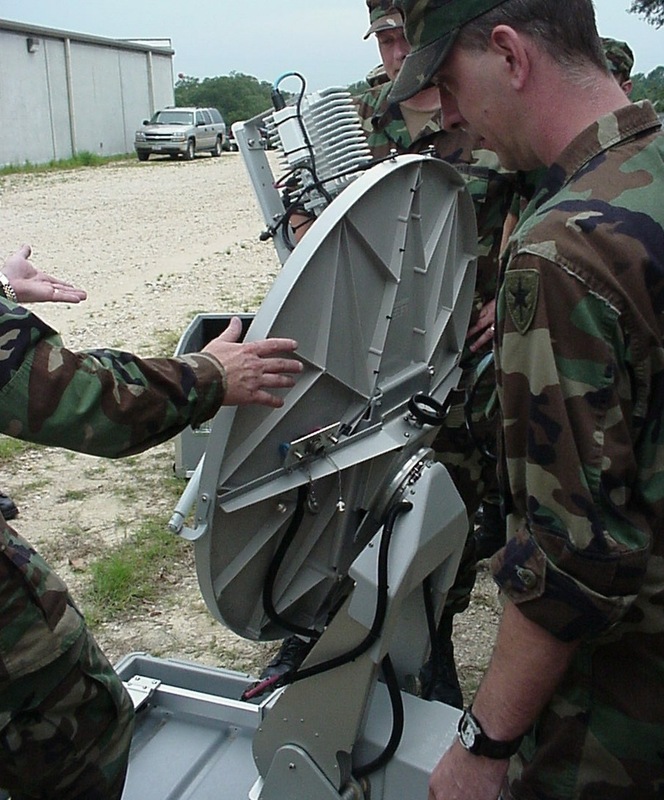 The thrid section holds the ACU-1000 which allows interconnectivity and net configuration/switching between the radios, POTS phones, VoIP phones, and communications via the sattelite link. 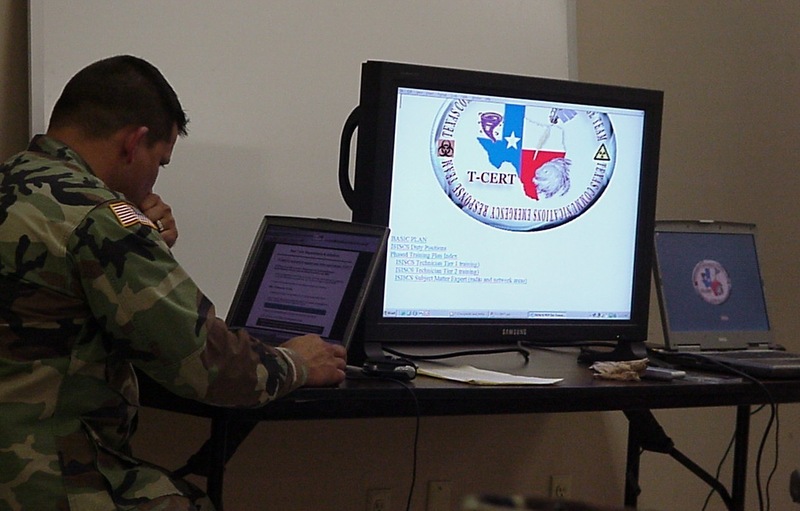 A laptop computer is used by an operator to control the interconnections on the voice network. Up to 7 nets can be configured at one time. Due to the GUI computer control and the ACU-1000, "old-skool" switchboard operation is not required. You can just "click" a radio onto a net. 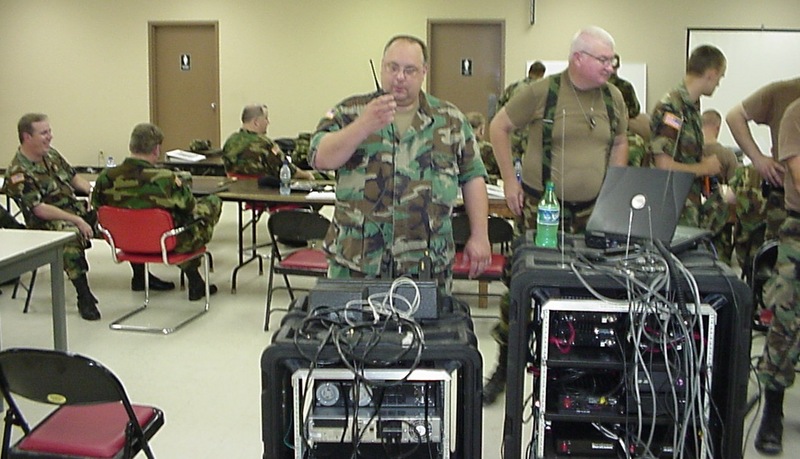 Any radio can be added in an emergency by cutting off its mike and connecting the wires to a DB15 for the ACU-1000. Part of the software utility allows the TX and RX audio levels and other parameters to be adjusted, and the profiles can be saved so they can be immediately re-loaded in the future. 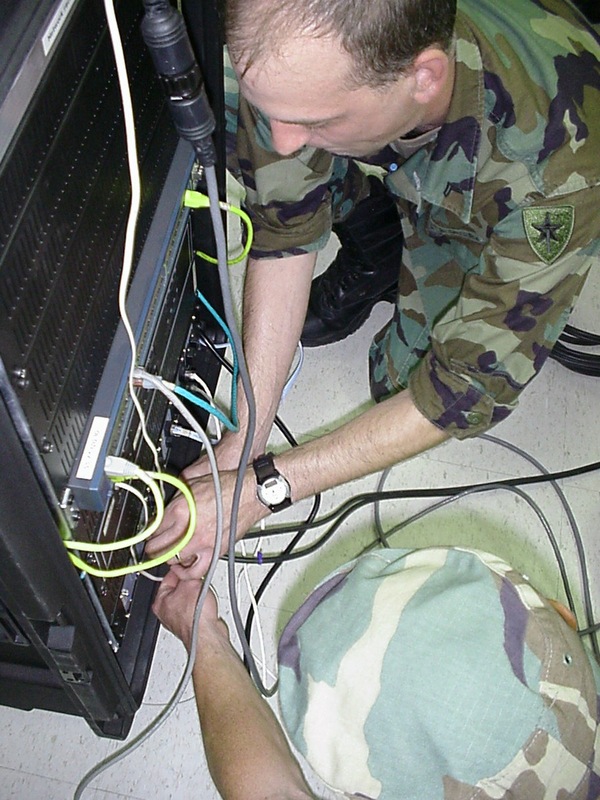 Commercially available, radio-specific cables and profiles are available to connect almost any radio to the ACU-1000. Network Rack. 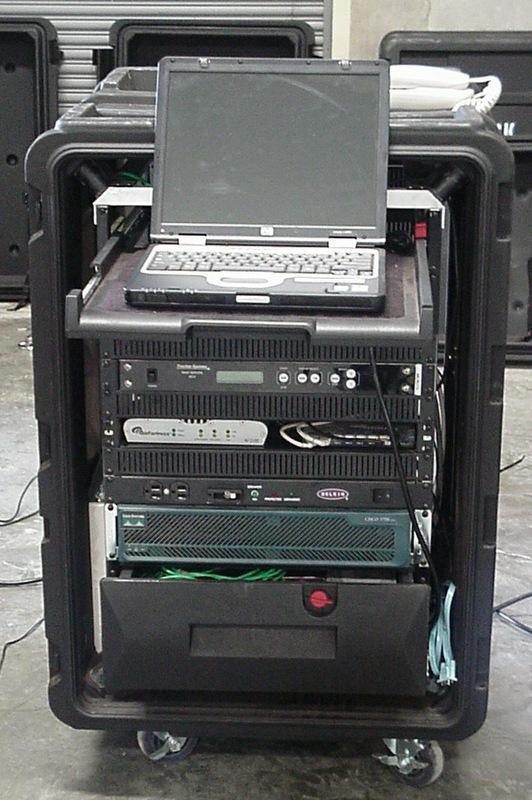 The network rack contains the sattelite dish controller, sattelite modem, Cisco router, LAN switch, VoIP and POTS phone switches, ethernet connections, and a network operator's consiole. Other peripherals not shown are wireless lan, videoconferencing system, and FAX/printer/scanner. Both encrypted and non-encrypted services are available. 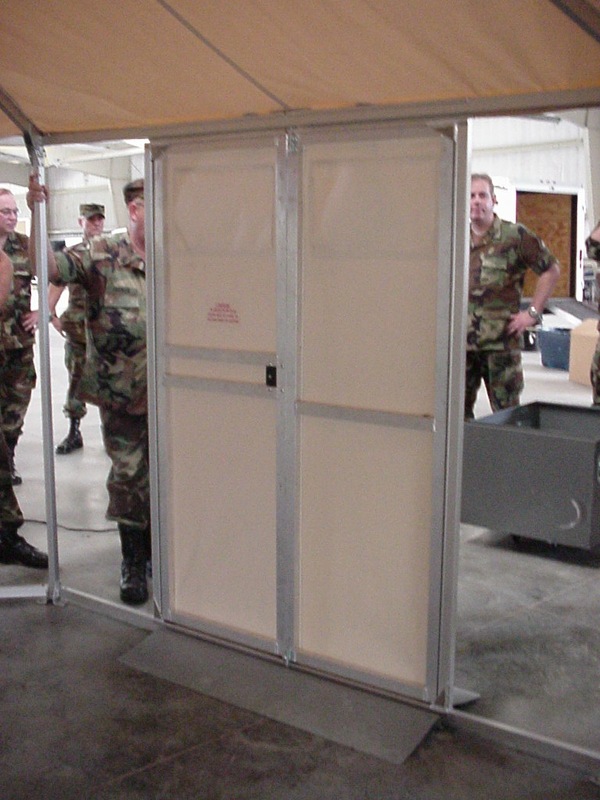 Keeping the news media's long nose out of our commo is important in an emergency operation. Let the listen to the police and EMS if they want to snoop. Power rack. The power rack accepts either commercial or generated power and conditions it for the system's use. 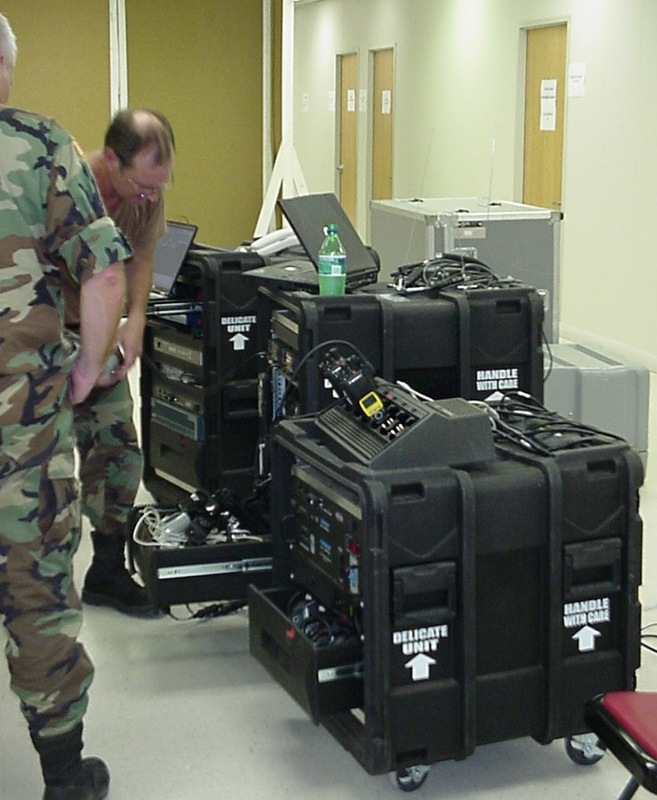 It also contains an APC UPS with a feature that allows the UPS to be started from its own internal storage battery in order to get the sattelite link system up immediately, while other parts of the system such as the generator and radios are still being set up. 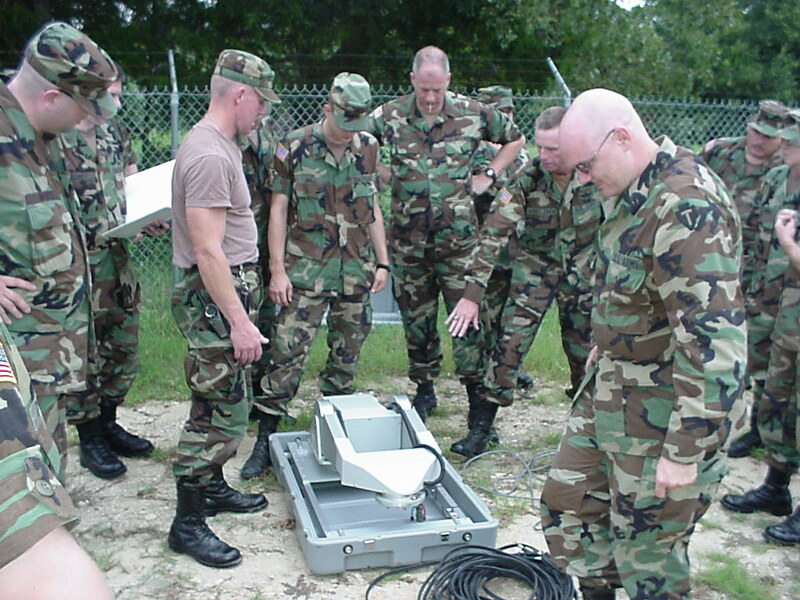 What this does is allow us to immediately make a report and receive further orders. Here's what the system looks like as it comes out of the trailer. 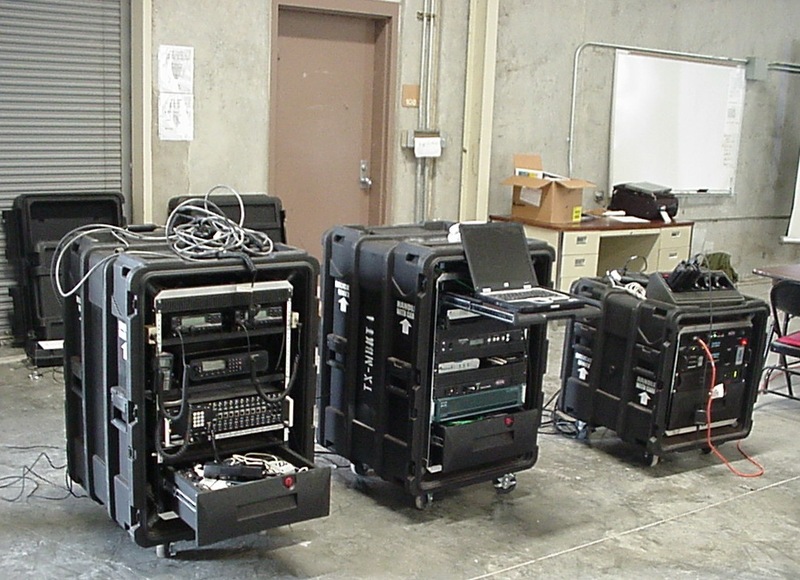 It's a bunch of cases with the gear stowed in an efficient manner. 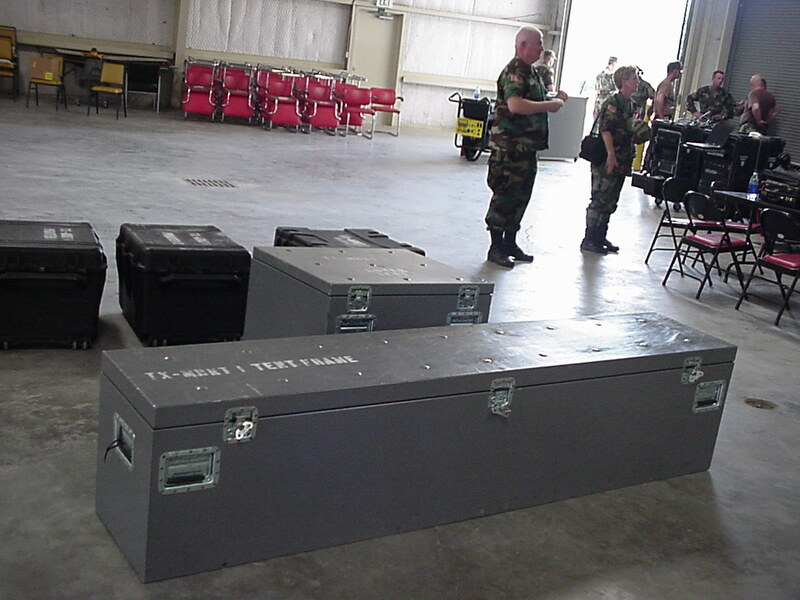 The two large gray cases contain the tent. 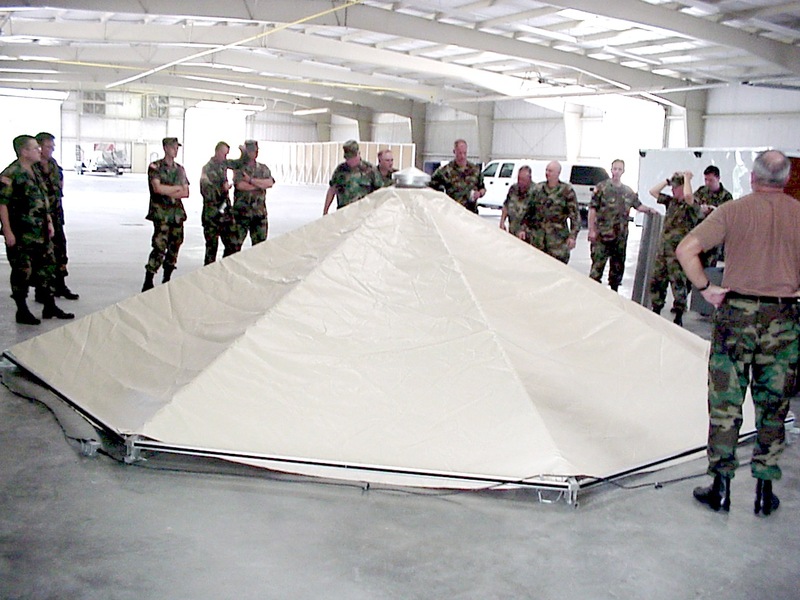 The tent is not a military tent, but a durable commercially available tent designed for civillian incident command. 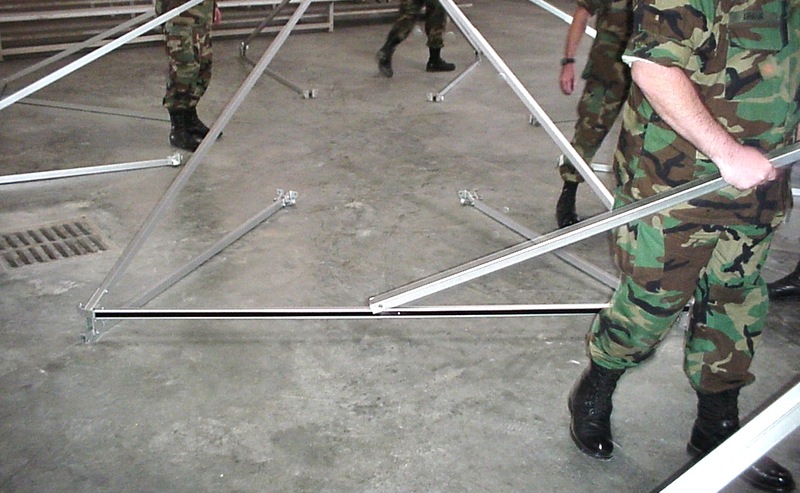 The advantage of this kind of tent is that it can be set up very quickly using miniman manpower with or without stakes on any surface from sand to mud to concrete. The tent is octagonal and 20 FT across. It comes with a door and a vent fan, lights, and can be air conditioned (take my word, you want the A/C!). This is one of the classroom arrangements. Due to the building being heavily utilized, we set up in the equipment bay. Later we occupied in force a classroom. Here's some of the gear set up in the classroom. 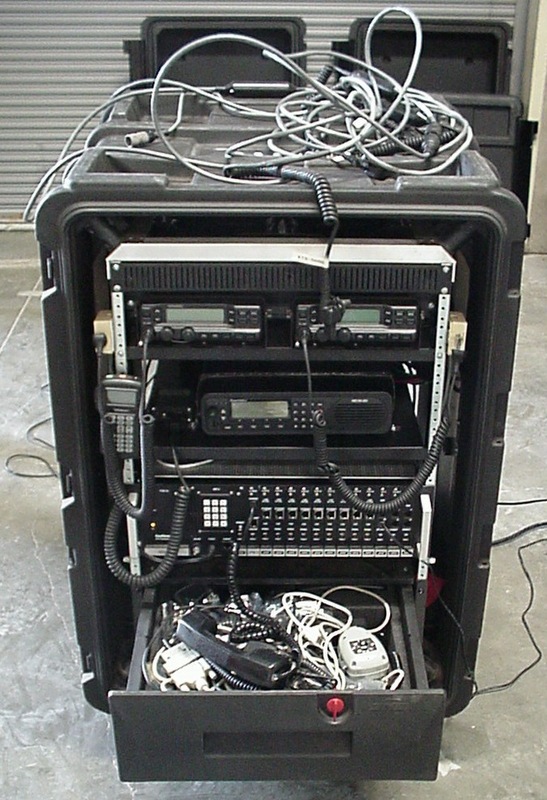 Although the handheld radio rack is shown sitting on the power rack and other stuff is stacked up liewise, that is only a convenience. 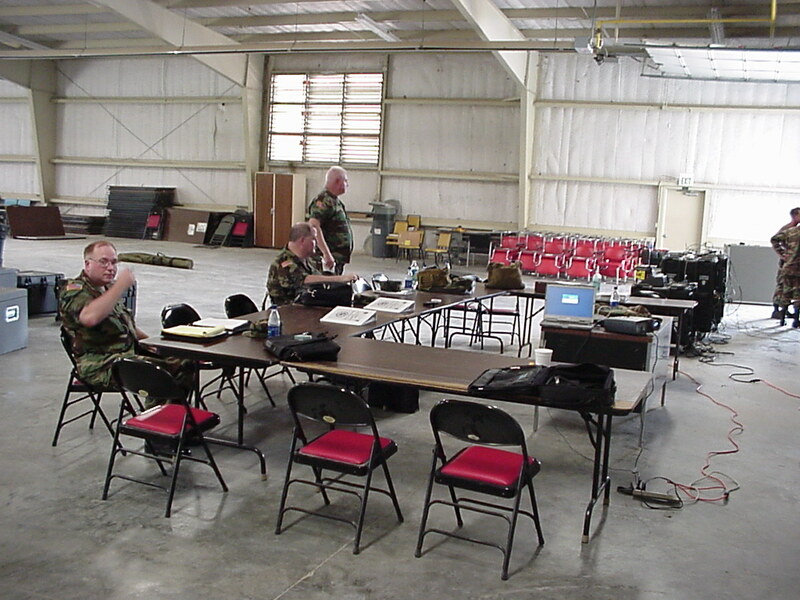 Normally we would use the kit's tables for the handhelds, laptops, fax, and videoconference units. Food and drink on top of the rack is NOT authorized! View of the backs of the racks. 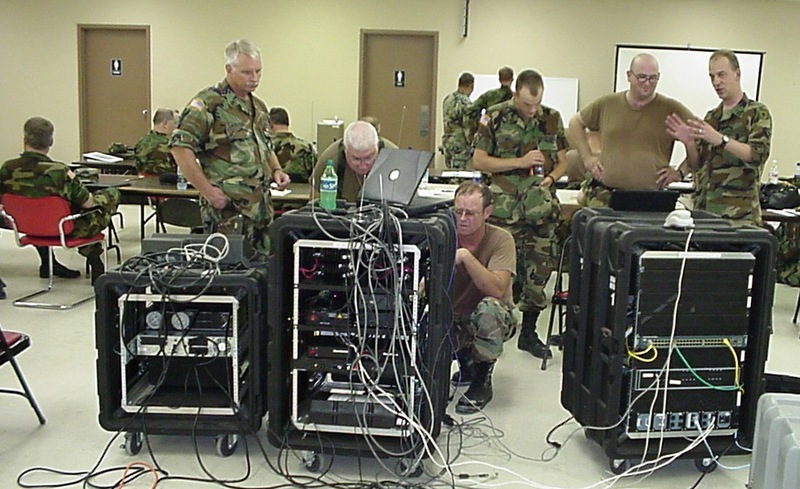 The power inputs can be seen, as well as the backs of the radios and network gear. The large twist-lok conector is only used with the generator. It's empty since we were using a wall outlet for this part of the training. That would be myself on the mike. CPT Amerson was the lead instructor. He's had 26 years in infantry, HOOAH! Training on the dish aimer and how to set it up. There is a checklist for everything. Connecting the signal cables and the power cables to the aimer. It's important to make sure the weatherproofing boots are fully up over the connectors once they are hand-tightened. 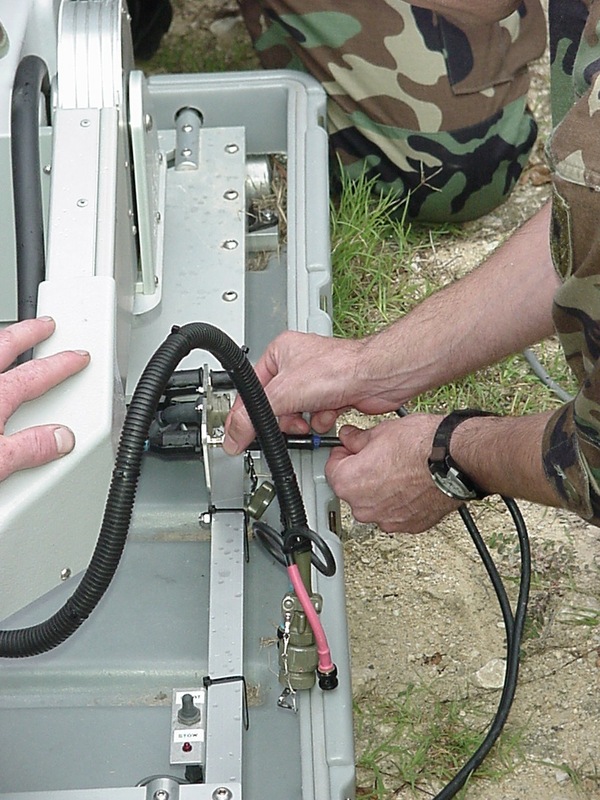 These connections are always made before applying power to the modem, LNB, or sattelite dish controller. Here's the other end of those cables. They plug into a bulkhead connector at the base of the rear of the network rack. 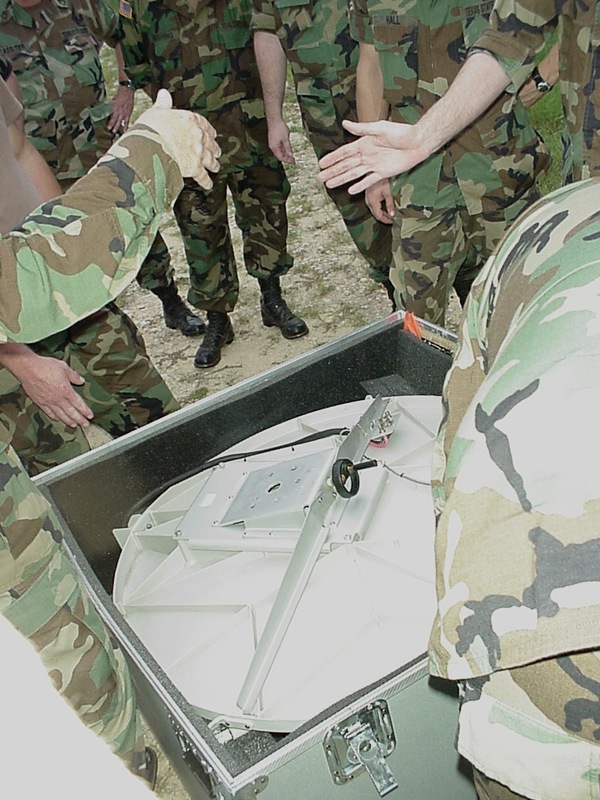 The dish is uncrated and instructions given for how to position it for mounting to the aimer. Once it is mounted, the black crank is turned in order to lock it to the mount. The dish is now mounted. Note the LNB assembly is still folded up in the transport position. 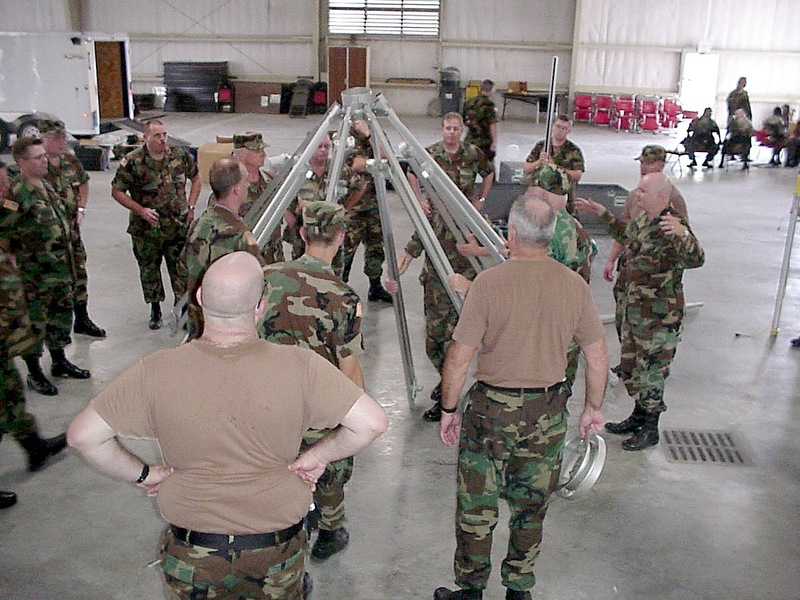 The radial beams which are hinged at the top ring are unfolded. The legs (columns for the walls) are now dropped. 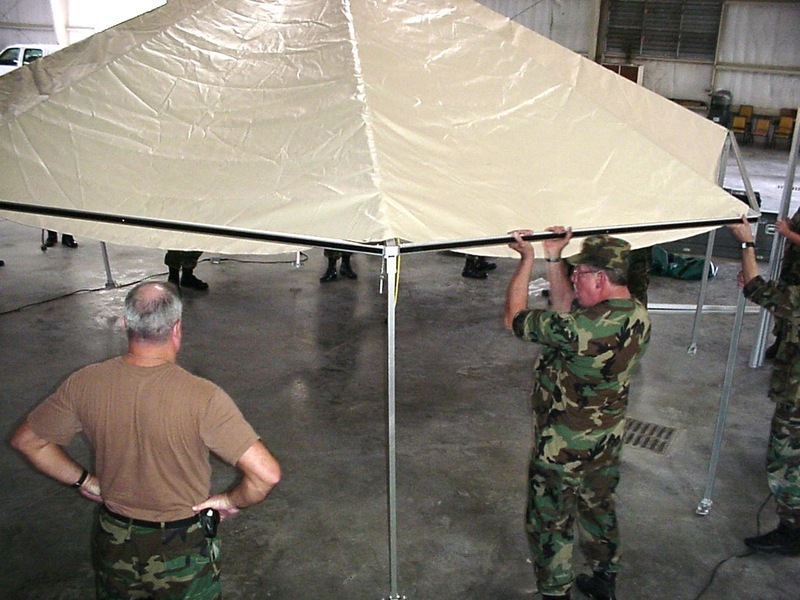 The roof beams are fully extended to the diameter of the tent. The first of the roof circumference beams is pit in place. These snap in place with metal pins. The ring of electrical outlets, which attach at roof level, are unwound and prepared. The center ring of the structure is clearly visible. This is where the exhaust fan and fan vent go. The waterproof flourescent lights are attached to the radial beams. 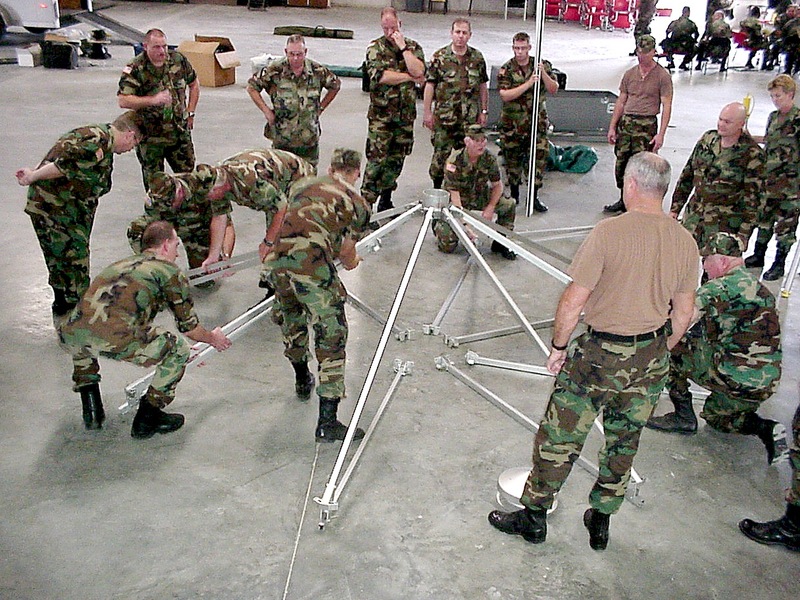 This is done now, before the tent is raised, otherwise they cannot be easily reached. Here the tent cover has been unfolded and the vent cover put in place. 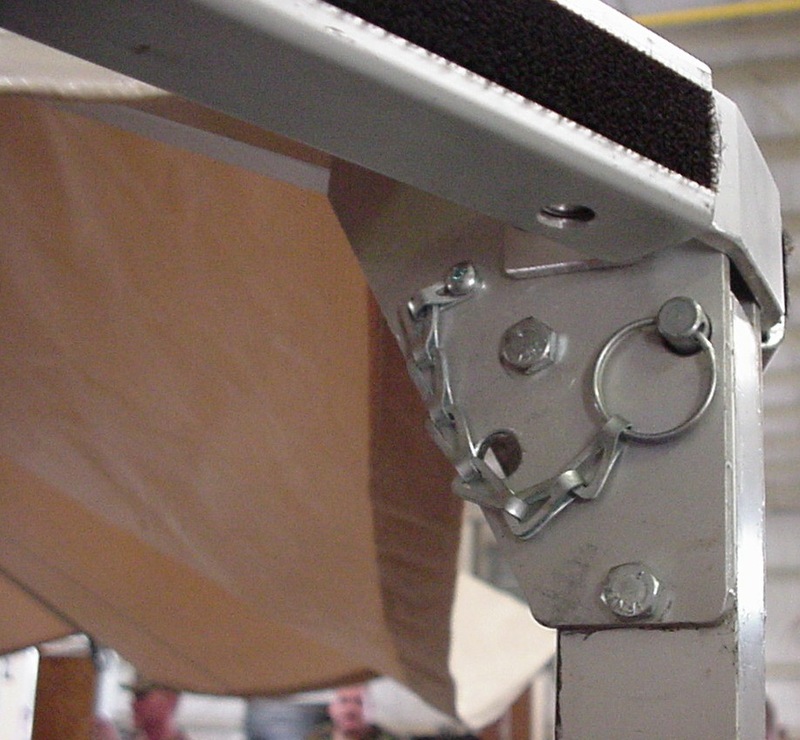 The cover is held on by springs that extend down to the top ring. Four men raile the tent. It's pretty lightweight but also strong. The instructions boast that one man can set this up, but it's not too easy. 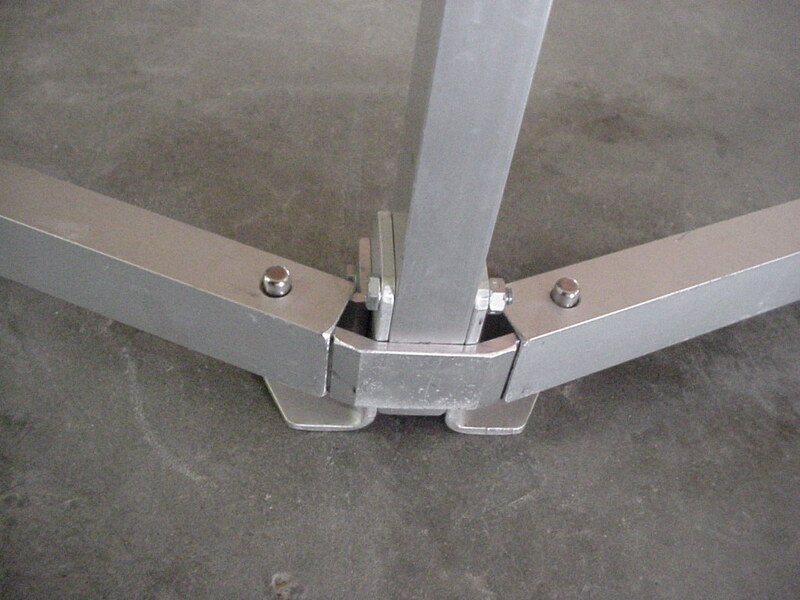 Close shot of the roof corner joint showing correct placement of the leg locking pin. The velcro on the side of the beam is where the edge of the tent roof attaches. Close shot of the bottom of a wall column. 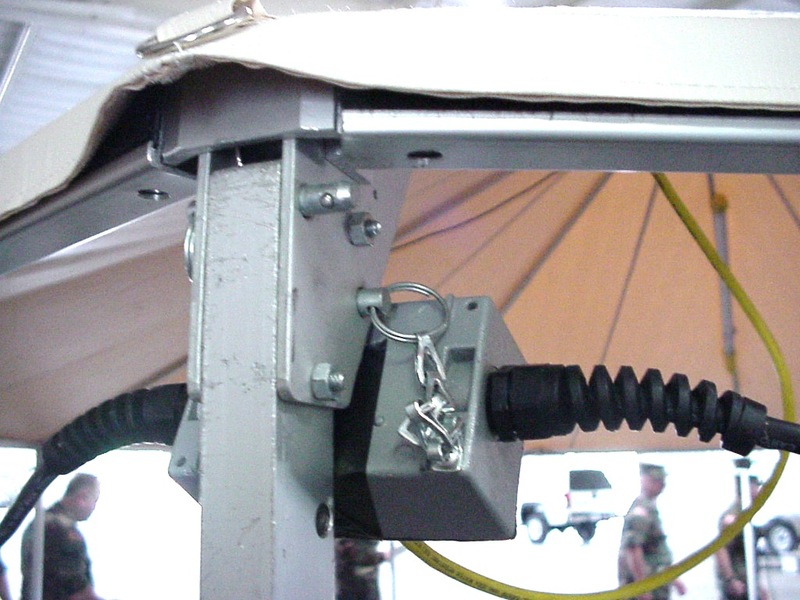 Note that the base of the tent has circumference beams and that they lock in place with the spring loaded pins just like the top circumference beams. The door and ramp are set in place. The ramp was laid down before the lower curcumference beam was placed. the door is one assembly that hands on the top circumference beam and sits over the lower circumference beam. The door frame has velcro on it for the tent roof, and there is a small semicircular flap of about 4" radius that comed down rigth over the centerline of the door frame to keep water out. The tent also comes with a floor and walls but we did not set them up. The power outlets were pinned in place in the corners along the top of the wall. There is one outlet every other wall column.